Instructions by Dan Mennill. Design by Ken Otter. Modified from Grubb & Bronson. 1995. Condor 7:1067-1070. 1.) Trim the PVC tubing into 35cm-long sections. In the front of the tube, at 8 cm from one end, cut a 3cm-diameter entrance hole (see step 1 in blueprint below). A hacksaw works well for cutting the PVC tubing and a pocket knife works well for cutting the entrance hole. If you're making a lot of nest boxes you may want to use high-powered equipment; I recommend a hole-bit on an electric drill or drill press to cut the entrance holes. 2.) 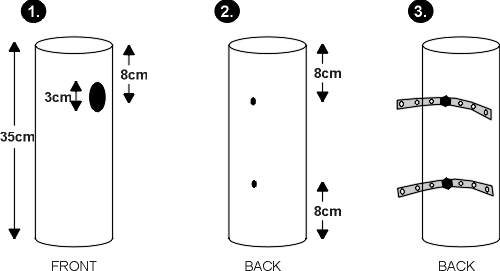 In the back of the tube, drill two small holes 8cm from top and 8cm from the bottom (see step 2 in blueprint below). Bolts will fit through these holes so you can attach the nest box to a tree) . 3.) Run a bolt through each of these two holes from the inside, through a section of strapping, and secure with a nut (see step 3 in blueprint below). 4.) PVC is much more slippery than wood! Using coarse sandpaper or a pocket knife, scuff up the outside of the nestbox, just below the entrance hole -- birds will grab on to the scuffed surface when they enter their nest. 5.) Because PVC is so slippery, you must also ensure that the birds inside can climb up to exit the nest hole. Scuff up the area from the bottom of the nest hole to the bottom of the box, to give the birds something to grab onto when they exit their nest from the inside. Additionally, or alternatively, attach a short peice of duct tape to the inside of the nest box, just underneath the entrance hole. 6.) Put a PVC tube "cap" on the bottom of the tube. Use a few dabs of glue to hold the cap to the bottom. Fill the tube with wood shavings (or sawdust) right up to the bottom of the hole. The chickadees will excavate the wood shavings before using the box; I suppose the shavings make the tube seem more like a birch snag! To prevent the bottom cap from falling off when I'm pressing the shavings down into the tube I use a couple squirts of superglue. 7.) Rain and humidity sometimes collect in these nest boxes. Make holes in the bottom cap for drainage. You can either drill a few holes in the bottom or you can use a hammer and nail to poke a few holes in the bottom. 8.) If the box sits in the sun, it will get very hot inside. Consider drilling extra holes for ventilation. 9.) Put a cap on the top of the nest box (don't glue it in place -- you will want to be able to remove the lid to add new wood shavings next year). Attach your nest box to a tree using nails through the holes in the strapping. Tree species: Chickadees in my study population at Queen's University Biological Station prefer birch (Betula papyrifera) snags as nest trees and we have had moderate success with birch-mounted boxes over the past eight years. We have also had some success with nest boxes mounted on beech (Fagus grandifolia) and hop hornbeam (Ostrya virginiana). Nest box orientation: Do chickadees choose nest sites based on the direction of the sun or prevailing winds or some other mysterious factor? I am presently conducting an experiment to test whether chickadees orient the entrances to their nest cavities in any particular direction and what benefits they may derive from such behaviour. Check back here hourly for updates. Nest box height: I recommend mounting your nest box(es) so that you can just reach your fingers in the entrance hole. That way you can check whether your boxes have been excavated, or easily climb up a step ladder to peek inside. Wood shaving / sawdust consistency: I pack wood shavings tightly into my boxes. 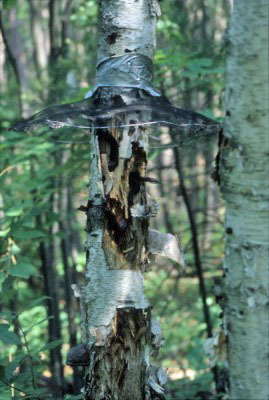 If you're trying to mimic a birch snag you want to present a potential winged resident with a dense woody center. Timing of nest box construction: Mount your boxes anytime, preferably long before the chickadees' breeding season begins (late April to early May). As winter residents, chickadees will use cavities for roost sites during really cold winter nights. I suspect that the chances of nest box occupation increase if the birds have a longer time to investigate the boxes. Pack your boxes with sawdust anually and do this prior the breeding season (i.e. a sunny autumn day seems like as good a time as any). Red-breasted Nuthatches: Red-breasted Nuthatches (Sitta canadensis) like these nest boxes also, and I have seen several pairs of nuthatches succesfully fledge young from these boxes. House wrens: House wrens (Troglodytes aedon) like these nest boxes too (although they can't excavate the sawdust). Look out; they will smash chickadees' eggs or even kill the nestlings in order to usurp an active nest box! Wrens will fill an empty box with sticks in order to construct their nests.